What are the benefits of using social media for business? Consider that there are now more than 3 billion using social networks across the globe. And these people are using social to engage with brands. Sherpa Marketing found that more people follow brands on social media than follow celebrities. On Instagram alone 80 percent of people follow at least one business. If you’re not taking advantage of social, you’re missing out on a fast, inexpensive, and effective way to reach almost half the world’s population. Let’s look at the many ways in which social media can help you connect, engage, and grow your business. 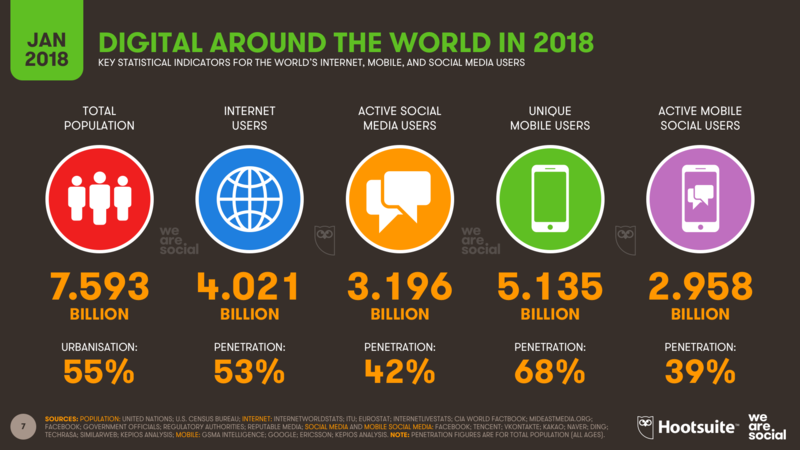 With nearly half of the world’s population using social media platforms, they’re a natural place to reach new and highly targeted potential customers. Think people only connect with brands they already know on social media? Consider that 60 percent of Instagram users say they discover new products on the platform. When Absolut Vodka ran an Instagram campaign to promote its limited edition Spark bottle, the company achieved a five-point lift in brand awareness. A UK study from Trinity Mirror Solutions found that more than half of adults do not trust a brand until they see “real-world proof” that the brand is keeping its promises. To connect with customers—and potential customers—you’ve got to show the human side of your brand. How are you embracing your brand values? (Do you even have brand values?) How are you looking out for the best interests of your customers and employees? Does your product really work? The ability to create real human connection is one of the key benefits of social media for business. We call these Meaningful Relationship Moments. Introduce your followers to the people who make up your company and showcase how existing customers are using and benefiting from your products. A social media advocacy program can be a great way to humanize your brand. No matter what industry your business is in, social media offers the opportunity to establish your brand as a thought leader—the go-to source for information on topics related to your niche. Like brand advocacy, thought leadership is a great way to build consumer trust. In fact, LinkedIn research in partnership with Edelman shows that marketers underestimate just how much thought leadership can impact trust, especially for B2B marketers. About half of B2B marketers surveyed believed their thought leadership would build trust in their companies. However, more than 80 percent of buyers said thought leadership builds trust. The 2018 Edelman Trust Barometer also found that 63 percent of people trust technical experts, compared to only 42 percent of people who trust businesses. 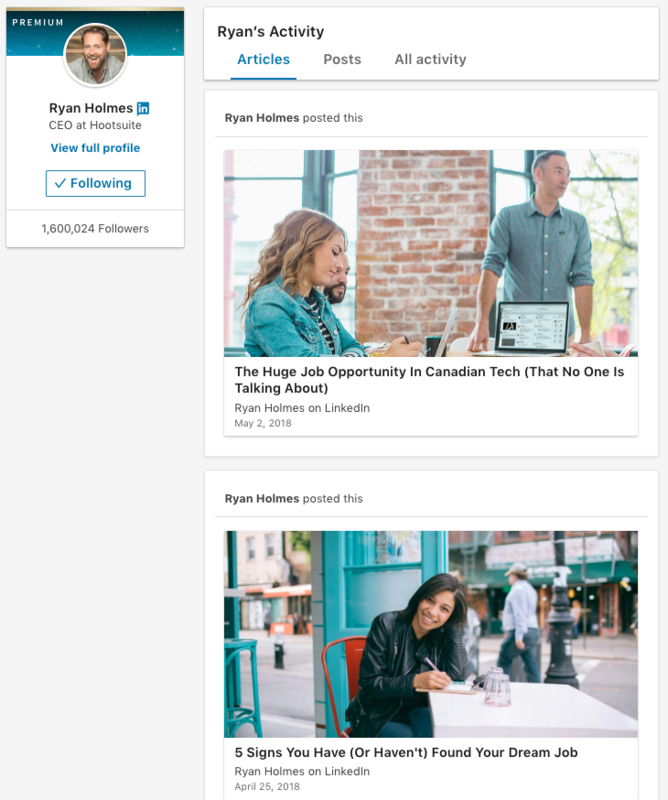 Hootsuite CEO Ryan Holmes has more than 1.5 million followers on LinkedIn, where he shares his insights about social media and entrepreneurship. LinkedIn—particularly the LinkedIn Publishing Platform—is a great social network to focus on when aiming to establish yourself as a thought leader. 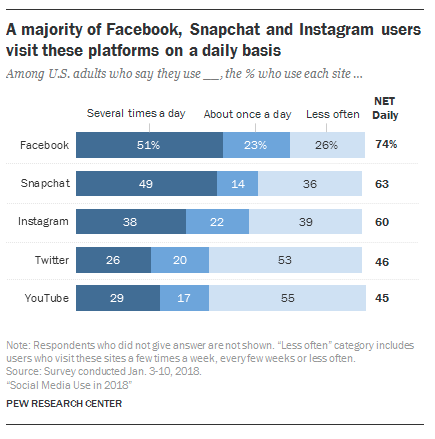 Most social media users log into their accounts at least once per day, according to Pew Research Center, and many people are checking social multiple times per day. Social media gives you to the opportunity to connect with fans and followers every time they log in. Keep your social posts entertaining and informative, and your followers will be glad to see your new content in their feeds, keeping you top of mind so you’re their first stop when they’re ready to make a purchase. Participating in social chats—like the weekly #HootChat on Twitter—can also be a great way to increase your visibility, get attention from new people, showcase your expertise, and drive traffic to your website. Offer great value in the chat, rather than being too promotional. Just make sure your website address is included in all of your social media profiles so that people who want to learn more about you can do so with one easy click. Even better, use a pinned post to highlight a landing page on your website that’s relevant to the chat. Social media offers an easy and low-commitment way for potential customers to express interest in your business and your products. Lead generation is such an important benefit of social media for business that many social networks offer advertising formats specifically designed to collect leads. 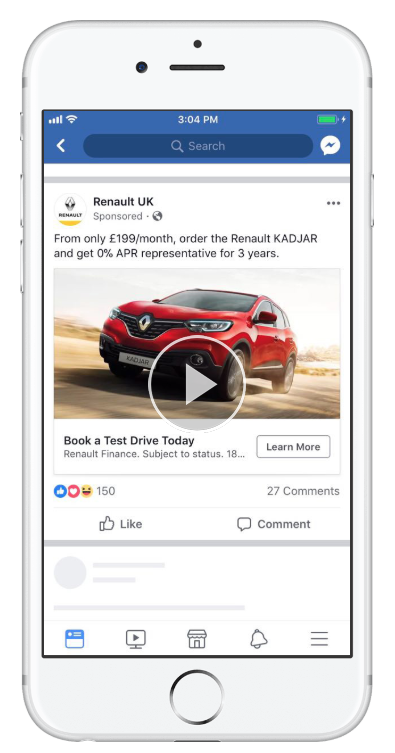 For example, Renault Europe used Facebook lead ads that allowed people interested in learning more about a new model to book a test drive directly from Facebook, with just a couple of taps. The ads had a 7.9 times lower cost per lead than ads linking to a form on the car manufacturer’s website. No matter what you sell, social media can help you sell it. Your social accounts are a critical part of your sales funnel—the process through which a new contact becomes a customer. As the number of people using social media continues to grow and social sales tools evolve, social networks will become increasingly important for product search and ecommerce. The time is right to align your social marketing and sales goals. For individual sales professionals, social selling is already a critical tool. Take Hootsuite Academy’s Social Selling Course and learn how to find leads and drive sales with social media. Word of mouth drives 20 to 50 percent of purchasing decisions. When you get people talking about your product or company on social media, you build brand awareness and credibility, and set yourself up for more sales. One key way to drive social word of mouth is to partner with influencers—people who have a large following on social media and can draw the attention of that following to your brand. 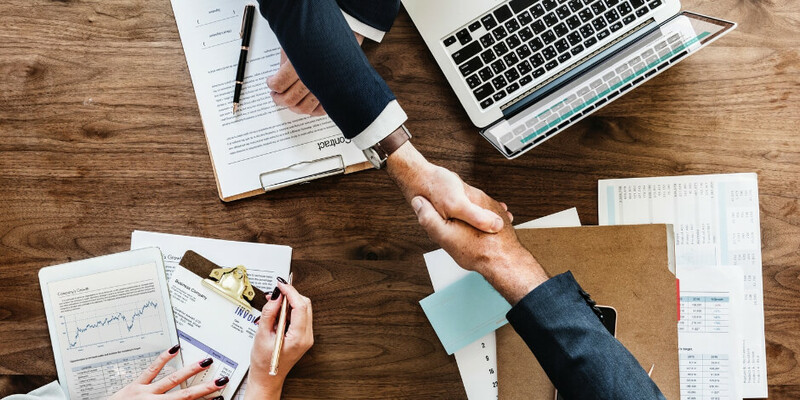 Research from Nielsen, Carat, and YouTube shows that collaborating with an influencer can give your brand four times more lift in brand familiarity than collaborating with a celebrity. Promoting your content on social channels is a great way to get your smart, well-researched content in front of new people, proving your expertise and growing your audience. For example, Adobe used LinkedIn Sponsored Content to showcase its research, including infographics and videos. 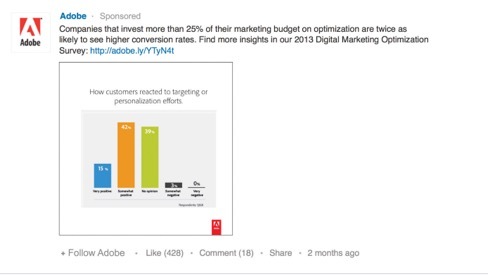 Marketing decisions-makers exposed to Adobe’s promoted content were 50 percent more likely to view Adobe as shaping the future of digital marketing and 79 percent more likely to agree that Adobe could help them optimize media spend. To maximize the social media for business benefits, make sure to have a content marketing plan in place. As people start liking, commenting on, and sharing your social posts, your content is exposed to new audiences—their friends and followers. Going viral takes this concept one step further. As people share your content with their networks, and their networks follow suit, your content spreads across the internet, getting thousands or even millions of shares. This exposure is especially beneficial because all those shares, likes, and comments show an existing connection with your brand. If I see that my friend likes your article, I may be inclined to check out what you have to say, even if I’ve never heard of your company before. In a world where there is far more content than any one person could ever consume, a friend’s social share acts as a kind of pre-screening. Going viral is no easy task, of course, but without social media it would be next to impossible. Source ideas: Ask your followers what they want, or engage in social listening, to come up with ideas for content you can create yourself. Put simply: Give people what they’re asking for. It’s a sure way to create content that people will want to read and share. Source material for posts: Create a contest or use a hashtag to source user-generated content (UGC) you can share. Getting your followers involved can build excitement about your brand while also providing you with a library of social posts to share over time. Just how much content can you get through a UGC campaign? 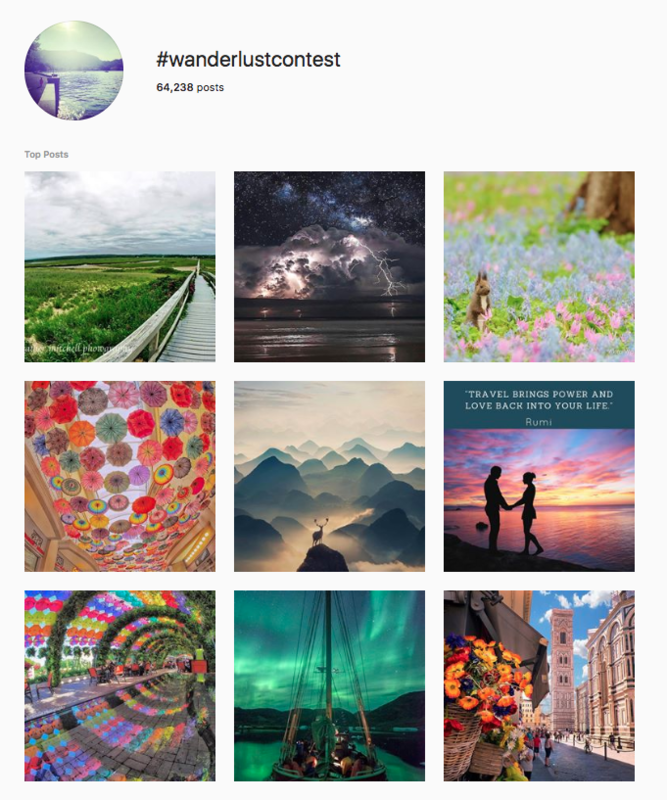 Check out the #wanderlustcontest hashtag from National Geographic, which has generated more than 60,000 posts. Your customers are already talking about you on social media, whether or not you’re there to respond. If you and your team are on the ball, you can pick up on important social posts about your brand to highlight the positive and address the negative before it turns into a major issue. Is someone saying something about your business that’s not true? Be sure to share your side of the story in a polite, professional way. Someone singing your praises? Send them plenty of thanks and draw attention to their kind words. When a Philadelphia Starbucks store had two black men arrested, the hashtag #BoycottStarbucks went viral, and fast. The hashtag was used more than 100,000 times in just three days. That is officially a crisis. Starbucks, to its credit, responded quickly. After this first apology, the company followed up with several more statements on social media, and announced that it would close all of its stores for a day of racial-bias training. It remains to be seen what the long-term effects of this incident will be for the Starbucks brand, but the consequences would almost certainly been worse if the company had not responded quickly and appropriately on social media. Does your company have a plan in place for dealing with a crisis? While smaller brands may not have a crisis blow up to such a large scale, a smaller number of shares can have a devastating impact within a tight-knit community or niche. Silence is not an option when it comes to responding to crises on social media. Maintaining well-run and managed social accounts and having a plan in place can help make sure you’re present and ready to engage if the worst occurs. Social networks give you the opportunity to interact directly with customers and fans, and likewise give them the chance to interact directly with your brand. Unlike traditional media, which offers only one-way communication, social media is a two-way street. If you want customers and followers to be engaged, you have to be engaged yourself. Stay active and respond to comments and questions on your own social media posts in a way that’s appropriate to your brand. You can also use social media monitoring to keep an eye on what people are saying across the social web. People expect brands to be available on social media and seek out their social accounts for customer service. Research published in the Harvard Business Review shows that brands who don’t meeting those expectations damage their bottom line. 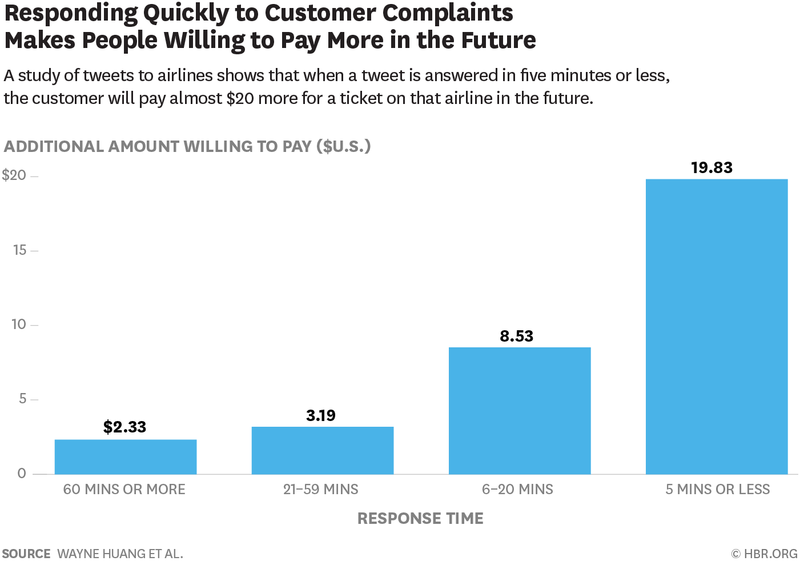 The HBR research, which specifically looks at Tweets, shows that customers who receive a response to their Tweet would be willing to spend more with the brand on a later purchase, especially if they get a response within five minutes. That holds true even when the initial Tweet was a flat-out complaint. We mentioned social media monitoring above as an important element of audience engagement. But it’s also important as a key source of intelligence about your brand, your competitors, and your niche. Social media generates a huge amount of data about your customers in real time. You can use that information to make smarter business decisions. All of the major social networks offer analytics that provide demographic information about the people interacting with your account. This can help you tailor your strategy to better speak to your real audience. We’ve created extensive guides on how to use analytics in Facebook, Instagram, Twitter, LinkedIn, Snapchat, and Pinterest, so there’s no excuse to remain in the dark about your customers and social followers. Lots of mentions is a good thing, right? Sure, in many cases. But if you’re getting lots of mentions with a negative sentiment, you need to do some quick thinking to figure out what’s gone wrong and address the problem. While it’s important to know how much people are talking about your brand online, it’s also important to know how people actually feel about your brand. 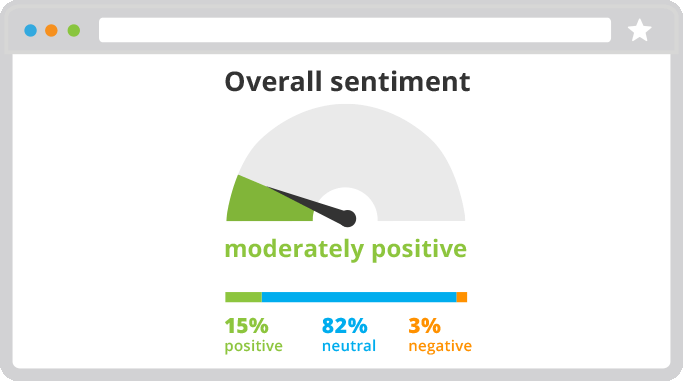 Using social media for your business allows you to stay on top of sentiment analysis so you can protect your brand reputation. It’s also important to know what people are saying about your competitors. For example, tracking mentions of your competitors might reveal pain points with their products that you could reach out to address, winning new customers in the process. When Uber Canada launched a promotion to deliver free ice cream for a day in Vancouver, things went spectacularly wrong. People couldn’t get their free ice cream, and they were not happy about it. They took to social media to complain. The social team at Skip The Dishes saw an opportunity and reached out to people complaining about Uber with a free ice cream delivery of their own, in the form of a Skip The Dishes credit. All those Uber haters quickly turned into Skip The Dishes fans, and new customers (since you had to create a Skip The Dishes Account to get your free ice cream). Monitoring the competition on social media also means you’ll be aware when you competitors launch new products, run promotions, and release new reports or data. In the online world, things move fast—and you can’t afford to be left behind. Keeping a virtual ear to the ground through social listening makes sure you’re always informed about upcoming changes to your industry that could affect the way you do business. Social ads are an inexpensive way to promote your business and distribute content. They also offer powerful targeting options so you can reach the right audience and make the most of your budget. 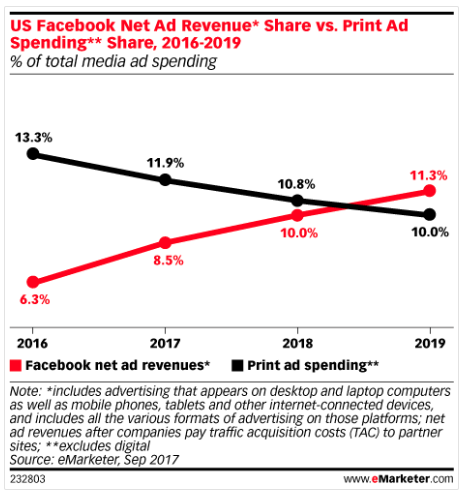 Savvy marketers have embraced this key benefit of social media for business: They will spend twice as much on Facebook ads in 2018 as they will on newspaper advertising. With ad targeting options including demographic information, geography, language, and even online behaviors, you can craft specific messages that best speak to different groups of potential customers, and only pay for the exact viewers you want to reach. Nearly 70 percent of online shopping carts are abandoned. People who have abandoned products in a shopping cart are prime potential customers. They have already found your website, browsed your products, and made a decision about what they might want. People abandon shopping carts for many reasons, but someone who has expressed this degree of interest in your company should not be ignored. Using tracking tools like the Facebook Pixel, you can show these potential customers social media ads for the exact products they have browsed on your website or placed in the shopping cart. 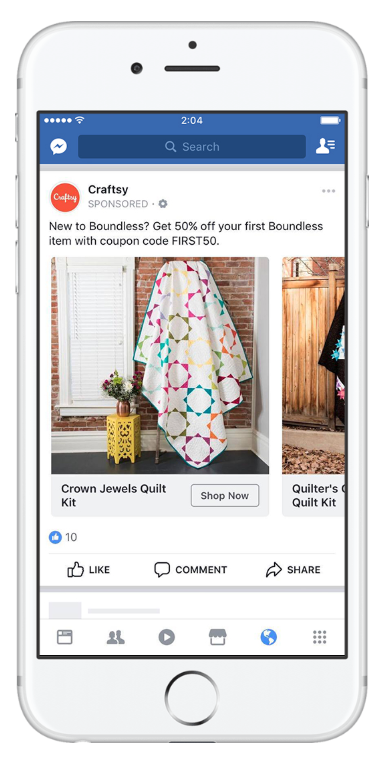 For example, the craft site Craftsy used retargeting Facebook ads to promote products to people who had already interacted with a product page on the Craftsy site. The campaign saw a 4.3 times return on ad spend and 33 percent increase in Facebook-driven revenue. It is always a challenge for marketers to prove return on investment. But with social media tracking and analytics tools, you can see the full impact of your social media activities, from follows to engagements right through to purchases. Tools like Google Analytics and Hootsuite Impact track website traffic generated from social media, conversions, email sign-ups, and ROI for both organic and paid social media campaigns. UTM parameters are another great tracking tool that will help you see which social networks are providing the most benefits for your business.